Aberrant epigenetic profiles are concomitant with a spectrum of developmental defects and diseases. Role of methylation is an increasingly accepted factor in the pathophysiology of diabetes and its associated complications. This study aims to examine the correlation between oxidative stress and methylation of β1, β2 and β3-adrenergic receptors and to analyze the differential variability in the expression of these genes under hyperglycemic conditions. Human retinal endothelial cells were cultured in CSC complete medium in normal (5 mM) or high (25 mM) glucose to mimic a diabetic condition. Reverse transcription PCR and Western Blotting were performed to examine the expression of β1, β2 and β3-adrenergic receptors. For detections, immunocytochemistry was used. Bisulfite sequencing method was used for promoter methylation analysis. Apoptosis was determined by the terminal deoxynucleotidyl transferase dUTP nick-end labeling (TUNEL) assay. Dichlorodihydrofluorescein diacetate (DCFH-DA) assay was used to measure reactive oxygen species (ROS) production in the cells. β1 and β3-adrenergic receptors were expressed in retinal endothelial cells while β2-adrenergic receptor was not detectable both at protein and mRNA levels. Hyperglycemia had no significant effect on β1 and β2-adrenergic receptors methylation and expression however β3-adrenergic receptors showed a significantly higher expression (p < 0.05) and methylation (p < 0.01) in high and low glucose concentration respectively. 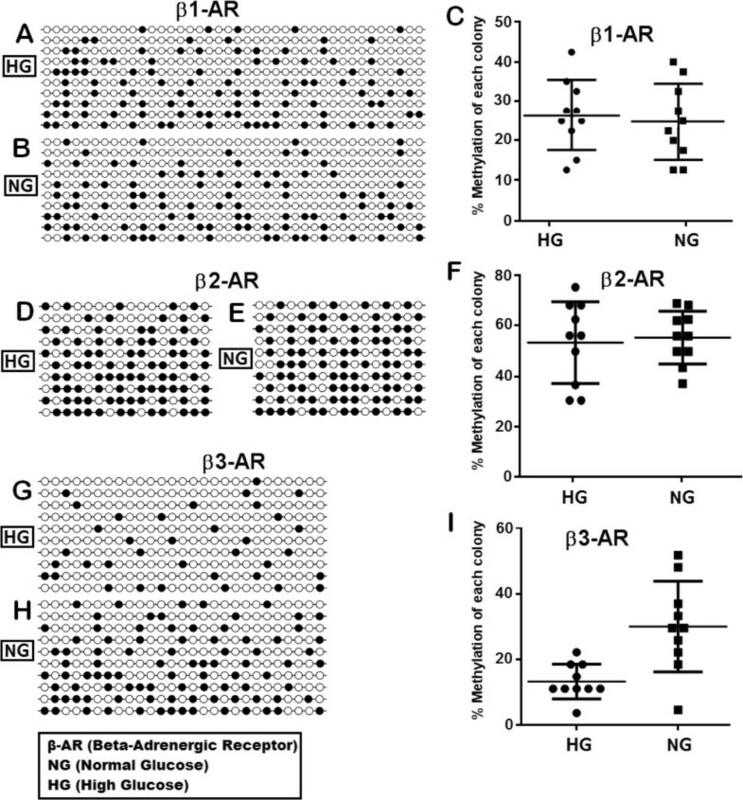 Apoptosis and oxidative stress were inversely correlated with β3-adrenergic receptors methylation with no significant effect on β1 and β2-adrenergic receptors. β2-adrenergic receptor was hypermethylated with halted expression. Our study demonstrates that β1 and β3-adrenergic receptors expressed in human retinal endothelial cells. Oxidative stress and apoptosis are inversely proportional to the extent of promoter methylation, suggesting that methylation loss might be due to oxidative stress-induced DNA damage. Diabetes is a growing epidemic, caused by excess glucose levels and body’s inability to produce or regulate insulin . It is predicted that the number of people with diabetes will increase from 171 million in 2000 to 366 million by 2030 [2, 3]. Diabetes is linked to several vascular pathologies, including severe blindness, atherosclerosis, stroke and renal failure. The growing number of people with diabetes suggests that diabetic retinopathy (DR) and diabetic macular edema (DME) will continue to be sight threatening diseases. Distinct morphological abnormalities in the retinal microvasculature either remain stable or progress to diabetic macular edema or proliferative diabetic retinopathy, the leading causes of severe visual impairment in working-age adults in industrialized countries [4, 5]. In vitro and in vivo studies have revealed that hyperglycemic environment induces a number of cellular changes which affect the function and viability of cells [6, 7]. Changes in the diabetic retina are due to a variety of factors including high glucose, oxidative stress and high levels of inflammatory markers [8, 9]. Reactive oxygen species (ROS), especially mitochondrial ROS, play a significant role in modulating the cellular redox status . Excessive production of ROS and the impairment of the oxidant/antioxidant balance may in part underlie the pathogenesis of diabetes and its associated complications . Actions of such key pathological mediators of diabetes can lead to dysregulated epigenetic mechanisms that affect chromatin structure and gene expression profiles . DNA methylation is one of the mechanisms for the epigenetic control of gene expression and aberrant DNA methylation patterns of CpG islands can influence normal transcriptional regulation in various diseases . Beta adrenergic receptors are G protein coupled receptors (GPCRs), initially characterized by Ahlquist in 1948. . Activation of these receptors takes place at the transmembrane region, which allows ligand binding and elicit a range of cellular actions such as phosphorylation and activation of various signaling pathways . Upon binding of specific ligands, β1 and β2-adrenergic receptors activate the stimulatory G protein resulting in the dissociation of G protein subunits αβ from γ. The αβ subunits are linked to the stimulation of intracellular adenylyl cyclase, followed by the conversion of adenosine triphosphate into cyclic adenosine monophosphate (cAMP) and consequently leads to activation of protein kinase A and phosphorylation of several other substrates [16, 17]. However contrary to β1 and β2-adrenergic receptors, β3-adrenergic receptor couple through the inhibitory G protein (Gi), causing a reduced generation of cAMP . Work in animal models suggests that adrenergic receptor agents may promote corneal wound healing and it is known that cornea has an abundance of β-adrenergic receptors in both the epithelium and endothelium of the cornea . Previous studies demonstrate that β-adrenergic receptors agonists have positive effects on the retina by reducing the inflammatory markers [20–22]. Studies on rats have demonstrated that highly selective agonists for β-ARs partially reversed obesity  and insulin resistance . Similarly β-adrenergic receptor agonists like isoproterenol inhibits the formation of degenerative capillaries, prevents apoptosis of cells and reduces tumor necrosis factor (TNF) while anatagonists increase retinal dysfunction . The role of Beta-adrenergic receptor agonists and antagonists in the treatments of glaucoma, diabetic retinopathy, and their potential mechanisms of actions, are still under investigation. Type 2 diabetes is a multifactorial disease caused by a number of genetic, epigenetic and environmental factors . In mammalian cells, DNA methylation takes place at cytosine in CpG dinucleotides and has been associated with transcriptional silencing . Recent studies have shown that epigenetic modifications such as DNA methylation and histone modifications may affect the pathogenesis of type 2 diabetes [28, 29]. Differential gene expressions show dynamic alterations in gene transcription and mRNA stability that can be influenced by the epigenetic modification of the genome in response to chronic hyperglycemic stress [30, 31]. A number of studies have evaluated the epigenetic mechanisms in various developmental defects and diseases. Oxidative stress and alterations in DNA methylation have also been observed in diabetes, but no clear correlation between these events has been demonstrated until now. Very little research has focused on the epigenetics of adrenergic receptors in the eye and its relation to diabetic retinopathy. In the present study, we sought to determine which subtypes of Beta-adrenergic receptors that were expressed in retinal endothelial cells, and assessed the hyperglycemia induced differential expression. In addition we analyzed the role of oxidative stress modulating CpG methylation in the promoters of β1, β2 and β3-adrenergic receptors. Human retinal endothelial cells (Cell Systems, ACBRI 181) were cultured in CSC complete medium (Cell Systems, 4Z0-500) supplemented with 10% serum, 1% Penicillin Streptomycin and animal derived growth factors. Cells were grown in attachment factor-coated dishes containing normal (5 mM, 0.9008 g/L) and high (25 mM, 4.5 g/L) glucose. When the cell reached 80% confluence, they were passaged with the use of a passage reagent group, supplied with the complete medium kit (Cell systems). The cells between 3-6 passages were used in all experiments and grown in 5% CO2 at 37°C. Media was changed every 2 to 3 days. The beta-adrenergic receptors were identified as described earlier , with minor changes. Retinal endothelial cells were seeded (50,000/well) onto 6-well plates with sterile coverslips in medium containing 5 mM (normal glucose) and 25 mM (high glucose). They were allowed to attach and proliferate in the respective medium for 2 days. The cells were fixed with cold methanol for 10 minutes at -20°C, rinsed twice with PBS, blocked at room temperature with 0.5% Tween (v/v) and 2% BSA (w/v) in PBS (blocking solution) for 1 hour and rinsed again twice with PBS. The wells were incubated overnight with primary antibodies against β1 adrenergic receptor (Santa Cruz, sc-568), β2-adrenergic receptor (Santa Cruz, sc-569) and β3-adrenergic receptor (Santa Cruz, sc-1472) in blocking solution at a dilution of 1:100. Anti-β-actin (sc-7210) antibodies were used as positive control. The following day, the cells were washed twice with PBS and incubated for 1 hour in dark room with secondary antibodies conjugated with fluorescein isothiocyanate (FITC) in blocking solution at a dilution of 1:200. After rinsing twice with PBS, the coverslips were mounted with antifading medium (Life Technologies, ProLong Gold) and analyzed under fluorescence microscope. Total RNA from Human retinal endothelial cells (HREC) was isolated using RNeasy commercial kit (Qiagen, cat no 74104) according to the manufacturer’s protocol and quantified spectrophotometrically. First-strand cDNA was synthesized with 1 μg of each DNA free total RNA, using iScript reverse transcription supermix (Biorad USA, cat no 170-8841) containing Moloney murine leukemia virus reverse transcriptase, RNase inhibitor, dNTPs, oligo-(dT), random primers, buffer, MgCl2 and stabilizers. No-RT control with the same amount of RNA but without RT was included to check genomic DNA carryover in RNA. Reaction conditions for cDNA synthesis were 25°C for 5 minutes, 42°C for 50 minutes and 85°C for 5 minutes. Equal amounts of cDNA were subsequently used for amplification in a 50 μl PCR reaction using EmeraldAmp PCR Master Mix (Takara, Japan), containing Taq polymerase, dNTPs, buffer and primers targeting β1-adrenergic receptor, β2-adrenergic receptor and β3-adrenergic receptor. PCR was performed with an initial denaturation step at 94°C for 3 minutes, followed by denaturation at 94°C for 30 seconds, annealing (60°C for β1-AR; 58°C for β2-AR; 61°C for β3-AR each for 30 seconds) and extension at 72°C for 1 minute. GAPDH was used as quantitative control in each PCR reaction. The PCR products were separated on 1.5% agarose gels and visualized using ethidium bromide staining under UV transillumination. Primers sequences of β1-AR, β2-AR and β3-AR are given in the Table 1. Human retinal endothelial cells were lysed, centrifuged and proteins were extracted according to the manufacturer’s protocol (Sigma). Bradford assay (Bio-Rad Laboratories) was used to quantify the protein concentrations in the supernatants. 30 μg proteins of the lysate from high glucose and low glucose were loaded in each well and separated on 10% SDS-PAGE (Precast gels, Bio-Rad, cat no 456-1093). Gels were electrophoretically transferred to nitrocellulose membranes and blocked for 60 min with Tris-buffered saline (TBS) containing 5% nonfat milk (Bio-Rad, USA, cat no 170-6404) and 0.1% Tween-20. Blots were incubated overnight at 4°C with primary antibodies (1:3000) against β1-adrenergic receptor (Santa Cruz, sc-568), β2-adrenergic receptor (Santa Cruz, sc-569) and β3-adrenergic receptor (Santa Cruz, sc-1472). Anti-β-actin (sc-7210) antibodies were used to ensure the quality of protein separation and loading contents. After extensive washes, the membranes were incubated with HRP-conjugated IgG secondary antibodies (Santa Cruz, sc-2004) and visualized with enhanced chemiluminescence (Amersham Life Sciences, UK) using gel imaging system (Biospectrum 410, UVP). DNA damage was investigated and quantified with a colorimetric apoptosis detection kit (Titer TACS; R&D System) according to the manufacturer’s protocol. Kit contained TUNEL staining in a 96-well format. Retinal endothelial cells were cultured in medium containing 5 mM (normal) and 25 mM (high) glucose. Cells were then transferred into a 96-well plate (1 × 105 cells/well) and fixed with 3.7% buffered formaldehyde for 5 minutes followed by washing with PBS. Washing was followed by permeabilization of cells with 100% methanol for 20 minutes (at room temperature) and again washing with PBS. Following the manufacturer’s instructions, cells were then subjected to labeling procedure and the reaction was stopped with 0.2 N HCl after 30 minutes. Nuclease treated control was used to confirm the permeabilization and labeling reaction. The absorbance was measured at 450 nm with microplate reader. The intracellular ROS (reactive oxygen species) was measured by using 2′7′-dichloro-dihydro-fluorescin diacetate (DCFH-DA) reagent. The DCFH-DA enters through the cell membrane and enzymatically hydrolyzed by intracellular esterases to non-fluorescent dichlorofluorescin-diacetate (DCFHDA), which is then oxidized to highly fluorescent dichlorofluorescin (DCF) in the presence of intracellular reactive oxygen species. Retinal endothelial cells were seeded in 96-well black plates and allowed to grow for 24 hours. Cells were incubated for an additional 24 hours in media containing 5 mM (normal) and 25 mM (high) glucose. Cells were then treated with 5 μM DCFH-DA and the readings were taken at 485 nm excitation and 530 nm emission in a fluorescence plate reader. To calculate the amount of intracellular ROS produced, the mean control was subtracted from the mean experimental group. 8-Hydroxy-2′-deoxyguanosine (8-OHdG), one of the DNA lesions has been studied extensively as a marker of oxidative stress-mediated DNA damage, was estimated in retinal endothelial cells treated with high glucose, normal glucose and H2O2 as a control, using Oxiselect oxidative DNA damage ELISA kit (Cell Biolabs). Cells were grown and treated with high glucose (25 mM), normal glucose (5 mM) and H2O2 (50 mM) as a control. The whole experiment was performed as previously reported with minor modifications . DNA sequences of CpG islands in β1-adrenergic receptor (2161 bp), β2-adrenergic receptor (807 bp) and β3-adrenergic receptor (1522 bp) were retrieved from NCBI and UCSC genome browser. Promoter region of each gene from upstream -499 bp to downstream 100 bp, relative to CpG contents and transcription start sites, were identified using Eukaryotic Promoter Database (EPD). Subsequently, primers were designed within -499 to 100 bp region of each promoter with products containing 40 CpGs in β1-adrenergic receptor , 16 CpGs in β2-adrenergic receptor and 27 CpGs in β3-adrenergic receptor (Figure 1A, B and C). Promoter DNA sequences of β1, β2 and β3-adrenergic receptors from -499 to 100 bp. Relative to CpG contents and transcription start sites, sequences were retrieved from Eukaryotic Promoter Database (EPD). Arrows indicate forward and reverse primers that amplify regions containing 40 CpGs in β1-adrenergic receptor (A), 16 CpGs in β2-adrenergic receptor (B) and 27 CpGs in β3-adrenergic receptor (C). DNA was extracted from retinal endothelial cells grown in high and normal glucose using genomic DNA mini kit (Invitrogen USA, Cat no K1820-02) according to the manufacturer’s protocol. 500 ng of DNA was bisulfite-converted with Zymo EZ DNA methylation kit (cat no D5005, USA). PCR was used to amplify the bisulfite modified DNA using hot start taq DNA polymerase and bisulfite primers targeting the promoters of β1, β2 and β3-adrenergic receptors. PCR reaction conditions were set as 5 minutes at 95°C; 40 seconds at 95°C, 1 minute at 60°C and 1 minute at 72°C; and a 7 minutes final extension at 72°C. PCR products were analyzed on 2% agarose gel and purified using mini elute gel extraction kit (Qiagen, Cat no 28604) according to the manufacturer’s instructions. The purified products were ligated into pCR2.1 vector using TOPO TA Cloning Kit (Invetrogin). 4 μl of PCR product and 1 μl of TOPO vector, with a final volume of 6 μl were gently mixed and incubated at room temperature for 5 minutes. Cloning reaction was added to chemically competent DH5α, mixed and incubated on ice for 10 minutes. Then subjected the cells to heat shock the cells for 30 seconds at 42°C and again transferred to ice. 250 μl S.O.C medium was added (provided with kit, invitrogen), spread each transformation onto pre-warmed LB plates (ImMedia Amp Blue, Invitrogen USA) and incubated overnight at 37°C. pUC19 DNA was used as control. After blue-white screening, colonies (10 colonies for each β1, β2 and β3-adrenergic receptors) containing the insert were isolated and cultured overnight in ImMedia Amp Liquid (Invitrogen, USA). Favorgen plasmid extraction kit (cat no FAPDE100) was used to purify the plasmids from each colony, which were then sent for sequencing. After sequencing, UCSC genome browser, NCBI, Ensembl and QUMA (Quantification tool for methylation analysis) were used to align, visualize and quantify the bisulfite sequence data for CpG methylation of β1, β2 and β3-adrenergic receptors. The regions examined in all genes were located within CpG islands as shown in the Figure 2A, B and C.
Percent methylation of upstream and downstream sequences. 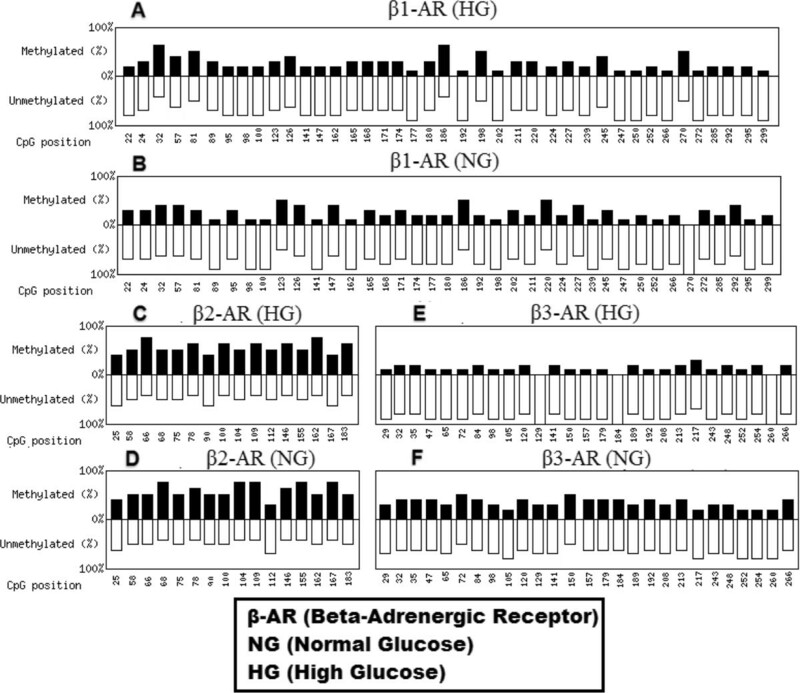 CpG islands and the sites which were amplified, bisulfite converted and sequenced for β1-adrenergic receptor (A), β2-adrenergic receptor (B) and β3-adrenergic receptor (C). All experiments were performed at least 3 times. The results were reported as mean SD. Student t test was used to determine statistical significance. A value of 0.05 was considered as significant. SPSS and graphpad prism softwares were used for analysis. Adrenergic receptors β1 and β3 were expressed in retinal endothelial cells both under high and normal glucose conditions. First immunocytochemistry was carried out (Figure 3A) and then reverse transcription was performed to confirm the presence of β1, β2 and β3-adrenergic receptors which revealed no expression of β2-adrenergic receptor but relatively high expression of β1 and β3-adrenergic receptors (Figure 3C and D). To reconfirm the expression of target genes, mRNA measurement by reverse transcription was followed by Western Blotting. In Western Blotting analysis, β1 and β3-adrenergic receptors were expressed in the same manner as previously detected by RT-PCR analysis (Figure 3E and F). Amplification of CT converted DNA and expression analysis. (A) Immunocytochemistry of β-adrenergic receptors, showing strong expression of β1and β3-adrenergic receptors. (B) Amplification of CT converted DNA using bisulfite converted primers for β1, β2 and β3-adrenergic receptors. (C) Expression levels of β1, β2 and β3-adrenergic receptors genes by reverse transcription, in high and normal glucose conditions. 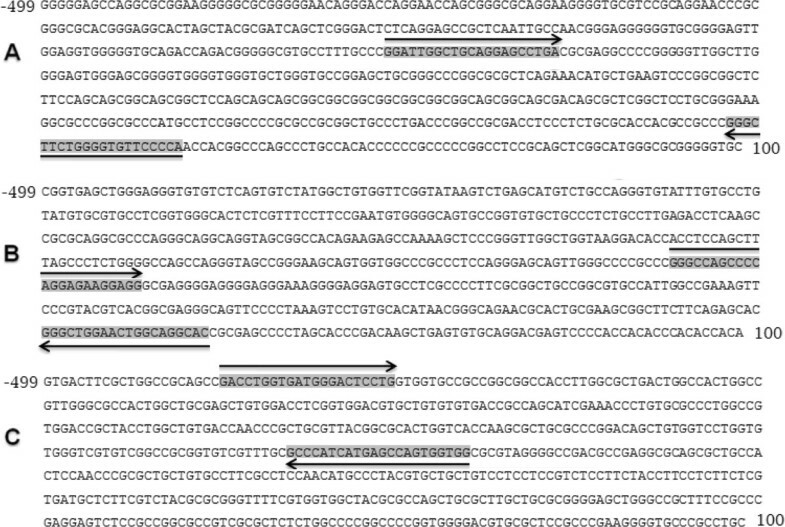 GAPDH was used as a loading control while cDNA without Reverse Transcriptase was used as negative control. (D) Graphical presentation of β1, β2 and β3-adrenergic receptors expression of mRNA (E) Expression of β1, β2 and β3-adrenergic receptors at protein level by Western Blotting in high and normal glucose. (F) Graphical presentation of relative expression of β1, β2 and β3-adrenergic receptors genes in retinal endothelial genes. Gene expression of β1, β2 and β3-adrenergic receptors were compared within the same endothelial cells, grown in high (25 mM) and normal (5 mM) glucose levels. Expression of β3-adrenergic receptor in high glucose was significantly (p < 0.05) different than the expression of the same gene in normal glucose at both protein and mRNA levels (Figure 3C, D, E and F). According to the results obtained from protein and mRNA analysis, the expression of β1-adrenergic receptor was not significantly different both in high and normal glucose conditions (p = 0.8544). β2-adrenergic receptor was not detectable at mRNA level as well as protein level, however very small and defused bands were seen when retinal endothelial cells were grown under hyperglycemic condition (Figure 3C and E). According to our data, β1-adrenergic receptor showed no significant difference in promoter methylation when cells were grown in either high or normal glucose levels. We evaluated 40 CpGs in the promoter of β1-adrenergic receptor which showed 26.5% methylation in high glucose and 24.5% methylation in normal glucose (Figure 4A, B and C). Our results indicate no significant association of promoter methylation and expression of β1-adrenergic receptor in human retinal endothelial cells cultured under hyperglycemic conditions (Figure 5A). β2-adrenergic receptor showed 53.7% and 55% methylation in high and normal glucose respectively. Although the difference in high and normal glucose did not achieve significance, hypermethylated promoter patterns show that β2-adrenergic receptor gene is silenced in retinal endothelial cells possibly due to hypermethylation of its promoter (Figure 4D, E and F). Promoter methylation of β3-adrenergic receptor was significantly different (p < 0.01) with 13.3% and 33.7% methylation in high and normal glucose respectively, having an inverse correlation with its expression (Figure 4G, H and I). Interestingly the expression of β3-adrenergic receptor was also significantly different both at mRNA (p < 0.05) and protein (p < 0.01) levels in high and normal glucose conditions. Total 27 CpGs were included in from the promoter of β3-adrenergic receptor.A graphical presentation of CpGs in 10 samples of each gene is shown in Figure 6 with black bars for methylated and white bars for unmethylated CpGs at a certain position. β1-adrenergic receptor shows maximum CpG methylation at position 32, 186, 198 and 270 in high glucose (Figure 6A) while in normal glucose the high occurrence of methylation was seen at position 123, 186 and 220(Figure 6B). In β2-adrenergic receptor methylation was high at position 66, 78, 100 and 162 (Figure 6C) and 68, 104, 109, 155 and 167 (Figure 6D) in high and normal glucose respectively. β3-adrenergic receptor revealed high methylation at position 217 in high glucose while at position 72 and 150 in normal glucose. Methylation analyses. Methylation (black dots) of β1-adrenergic receptor (A and B in high and normal glucose respectively), β2-adrenergic receptor (D and E in high and normal glucose respectively) and β3-adrenergic receptor (G and H in high and normal glucose respectively), using QUMA (Quantification tool for methylation analysis). Empty C, F and I show methylation of each colony. Percent methylation of β1-AR (A), β2-AR (B) and β 3-AR (C). β3-AR shows a significantly higher methylation in normal glucose conditions (p < 0.01). (D) shows terminal deoxynucleotidyl transferase dUTP nick-end labeling (TUNEL) assay that demonstrates a significantly high (p < 0.005) apoptosis of retinal endothelial cells grown in hyperglycemia. (E, F and G) show Dichlorodihydrofluorescein diacetate (DCFH-DA) assay showing a high production (p < 0.001) of reactive oxygen species (ROS) in retinal endothelial cells that were grown in high glucose (25 mM) condition (F), while low production in cells grown in normal glucose (5 mM) condition (G). 8-OHdG level in high and normal glucose (H) where H2O2 was used as control. Graphical presentation of CpGs in 10 samples of each gene. Black bars show methylated while white bar show unmethylated CpGs at a certain position. In β1-adrenergic receptor there are 40 CpGs as shown by A (high glucose) and B (lnormal glucose) while in β2-adrenergic receptor there are 16 CpGs (C and D, high glucose and normal glucose respectively). E and F show methylated and unmethylated CpGs in β3-adrenergic receptor in high and normal glucos respectively. Reactive oxygen species (ROS) production was significantly high (p < 0.001) in retinal cells grown in high glucose (25 mM) compared to normal (5 mM) glucose concentration as shown in Figure 5E, F and G. ROS production in high glucose was inversely proportional to methylation of β3-adrenergic receptor promoter in high glucose, suggesting that DNA damage by increased ROS production may induce loss of methylation under hyperglycemic condition. 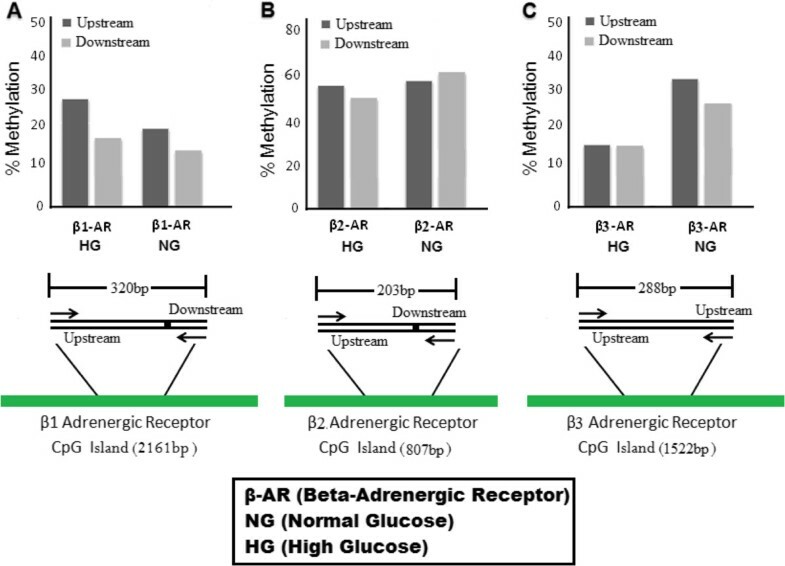 β2-adrenergic receptor showed the same pattern of methylation and ROS production in high glucose; however CpG methylation in high and normal glucose was not significantly different (Figures 4D and 5B). Apoptosis in high glucose was also significantly higher (p < 0.005) as compared to normal glucose and was positively correlated with the extent of ROS production. Diabetes mellitus is associated with oxidative stress, leading to protein, lipid and DNA modifications. Oxidative DNA damage is usually evaluated by measuring 8-OHdG (8-hydroxy-2-deoxy-guanosine). In our results 8-OHdG level was significantly (p < 0.05) higher in high glucose as compared to normal glucose. For β3-adrenergic receptor, DNA damage was inversely proportional to the level of CpG methylation in retinal endothelial cells (Figure 5C, F and H). Over all in this study, no significant association was found in methylation between upstream and downstream TSS except β1-adrenergic receptor in high glucose (p < 0.005) and β3-adrenergic receptor in normal glucose (p < 0.005). Upstream and downstream promoter methylation of β1-adrenergic receptor were 27.2% and 16.6% in high glucose, while 18.1% and 13.3% in normal glucose respectively. β2-adrenergic receptor showed 54.6% and 50% methylation values in high glucose while 55.1.7% and 60.6% methylation in normal glucose at upstream and downstream CpGs respectively. At upstream and downstream promoter sequences, methylation level of β3-adrenergic receptor were 13.3% and 13.4% in high glucose, while 34.1% and 26.3% in normal glucose respectively. Diabetes and diabetogenic agents such as high glucose and advanced glycation end-products have adverse effects in major target cells including endothelial cells and vascular smooth muscle cells [34–36]. In diabetic retinopathy hyperglycemia cause morphological and functional damage to the retina through a number of mechanisms including oxidative stress, proinflammatory cytokines and increased TNFa signaling [37–41]. According to the published reports, β-adrenergic receptors are likely to play a significant role in potentiating retinal endothelial cells against hyperglycemia and hyperglycemia-induced oxidative stress. The oxidative stress-induced damage is not limited to its direct effect on cellular components including DNA, protein, free fatty acids and lipids, but may extend to the ability of oxidative stress to alter gene expression. Thus we sought to investigate whether hyperglycemia induced oxidative stress and apoptosis can influence β-adrenergic receptors methylation and expression in retinal endothelial cells. DNA methylation is an important genetic mechanism that plays an essential role in the regulation of gene expression in various diseases such as diabetes, cancer, muscular dystrophy and a range of birth defects, but a comprehensive understanding of the diversity of the mechanisms involved in methylation is not understood . Despite limited data on the epigenetic regulation and its association with the disease progression, the underlying relationship between changes in promoter DNA methylation and differences in gene regulation are well established [43, 44]. Previous studies have provided evidence which link gene methylation and transcription in a number of genes and tissue specific cell lines; however methylation studies on G protein-coupled receptors in general and on β-adrenergic receptors in particular are very limited. We know very little about the changes in epigenetic profiles of β-adrenergic receptors that might explain differences in gene expression. DNA methylation, especially CpG methylation at promoter regions, has been an important modification that prevents transcriptions factors (TF) recruitment and consequently suppresses the transcription of various genes. Promoter methylation is considered a key regulator of biological processes such as suppression of transposable elements, X-chromosome inactivation and genomic imprinting. CpG dependent transcription factor binding is a prominent feature and provides support to understand the role and mechanism of TFs in epigenetic regulation . Various transcription factors including E2F, HIF-1, and c-myc bind to sequences containing CpGs in the promoters [46, 47]. Methylation does not interfere only in transcription factor binding activity, but also modulates chromatin structure by modifying the interaction between core histones and DNA. 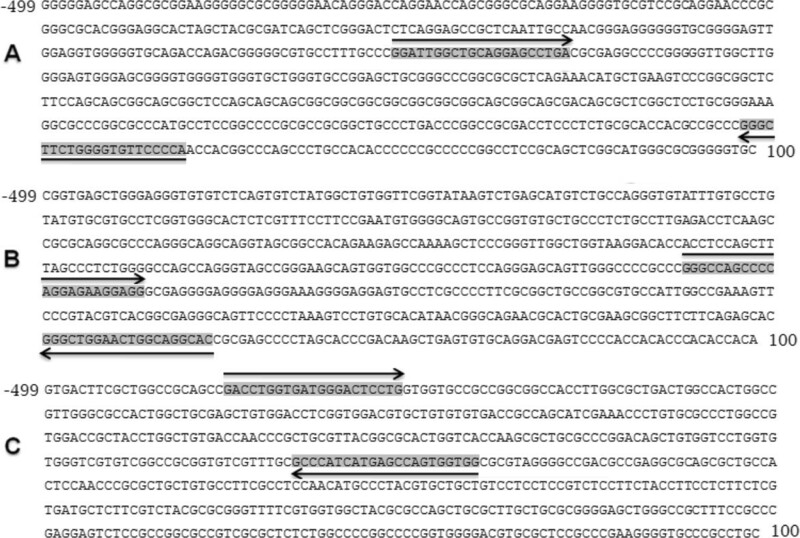 Previous studies show that Sp1 binding to its cognate sequence in certain genes is affected by methylation . Β-adrenergic receptors contain special sites such as TATA box, CAAT box, mRNA cap sites and GC rich sites where TF Sp1 binds . In a recent study, Mu et al. found that β2-adrenergic receptor stimulation led to decreased transcription of the gene encoding WNK4. Stimulation of β2-adrenergic receptor caused cAMP-dependent inhibition of histone deacetylase-8 (HDAC8) activity, increased histone acetylation and consequently binding of the glucocorticoid receptor to a negative glucocorticoid responsive element in the promoter region . For our results, we also hypothesize that hypermethylation of β2-adrenergic receptor might prevent the core transcription factors such as Sp1 to bind with its promoter and hence causing halted expression of β2-adrenergic receptor. In our study, protein and mRNA expression of β1 and β3-adrenergic receptors were confirmed in retinal endothelial cells however β2-adrenergic receptor was hard to detect both at mRNA and protein levels. According to several studies including our previous unpublished data, hyperglycemia increases the oxidative stress in several cell lines. Kong et al. and Takahata et al. in two different studies found that upregulation of β3-adrenergic receptor is associated with increased oxidative stress  while functional expression of β2-adrenergic receptor is responsible for protection against oxidative stress through promotion of glutathione synthesis . In 2003, Steinle et al. reported that β3-adrenergic receptor mediates migration and proliferation of retinal endothelial Cells. They Used BRL37344 agonist to stimulate the β3-adrenergic receptors on retinal endothelial cells and showed that these receptors could express in retinal endothelial cells. They reported that BRL37344-mediated migration could be alienated by prior inhibitors administration of Akt, PI3K, MEK and MMP-2/MMP-9 and hypothesized that PI3K may directly be linked to the β3-adrenergic receptor . 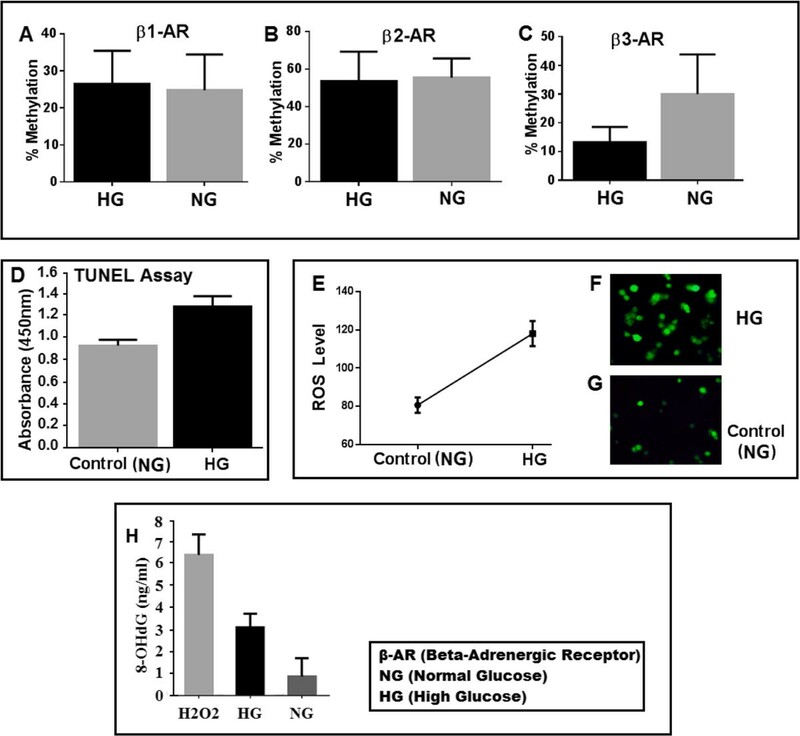 These studies led us to question whether our hyperglycemic endothelial cells with no agonist (BRL37344) and increased oxidative stress would differentially mediate the promoter methylation and expression of β3, β2 and β1-adrenergic receptors. In our study, hyperglycemic endothelial cells had significantly higher oxidative stress and consequently a higher expression of β3-adrenergic receptor. Methylation in β3-adrenergic receptor was significantly low in cells with significantly high apoptosis and oxidative stress as per our hypothesis. There is an exquisite interrelationship between methylation and oxidative stress. Glutathione is depleted by the excess of oxidative stress; consequently impairing the one-carbon cycle and causes undermethylation. However on the other hand glutathione, cysteine, and metallothionein get depleted by undermethylation with oxidative stress overload. Increased production of ROS can directly or indirectly cause a wide range of DNA lesions including base modifications, strand breakage, deletions and chromosomal rearrangements. Such alterations have been shown to impede the ability of DNA to function as a substrate for the DNA methyl transferases (DNMTs), resulting in global hypomethylation [54–56]. In our data β3-adrenergic receptor is hypomethylated with increased expression. The reason behind hyperglycemia led increase in β3-adrenergic receptor is not clear however Walker and Steinle suggest that the level of norepinephrine are significantly reduced as early as 1 week after streptozotocin (STZ) treatment, this loss of norepinephrine may consequently lead to denervation supersensitivity and increased expression of β1-adrenergic receptor in Muller cells . Hypermethylation and low expression of β2-adrenergic receptor is another interesting finding in our study. In our study we selected upstream and downstream regions, however high and normal glucose induced no variation and no association was seen in methylation between upstream and downstream sequences except β1-adrenergic receptor in high glucose and β3-adrenergic receptor in normal glucose. Our study demonstrates that β1 and β3-adrenergic receptors β-ARs expressed in human retinal endothelial cells HREC. Oxidative stress and apoptosis are inversely proportional to the extent of promoter methylation, suggesting that methylation loss might be due to oxidative stress-induced DNA damage. Collectively this study may help in understanding the pathophysiology of diabetic retinopathy and epigenetic regulation of β-adrenergic receptors. This work was supported by UMRG grant no RG528-13HTM, University of Malaya. SZS carried out the experiments and design of study. RQ helped in revising the manuscript and data analysis. The entire study was overseen by ISBI. All authors contributed to writing the manuscript and approved the final manuscript.